Are you in the mood for a mattress battle? Well, we sure hope so because things are about to heat up! In this week’s battle the customizable Helix mattress looks to take on the well known Tuft & Needle mattress. Does Helix have the power to take down Tuft & Needle? Continue reading below to find out! There are currently no discounts available on the Tuft & Needle mattress through Sleepopolis. In a bit of a time crunch? Click here to swing on down to the review summary. The Helix mattress is a customizable mattress built from layers of poly foam and microcoils. The following layered construction was built to fit my personal needs. The layers may be different depending on the results gathered from your Helix Sleep quiz. Top layer (comfort & cooling) – 2″ of Helix Dynamic Foam, a comfort poly foam similar in feel to latex. This foam has great bounce, cooling, and response time. The firmness of the foam will vary depending on the sleeper’s needs, but the indentation load deflection (ILD) ranges from 10-30. ILD is simply a measure of how firm a foam is. This foam has a PCF (pounds per cubic foot) density of 3.0. 2nd layer (pressure relief) – 2.4″ of microcoils. This layer is designed to give the mattress somewhat of an innerspring feel. The microcoils work to provide response, pressure relief, and a degree of bounce. The ILD of these coils is always 18. 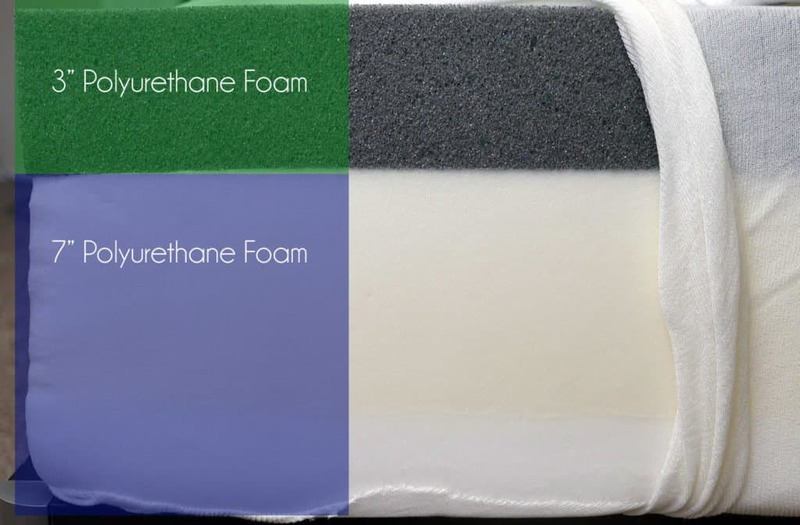 3rd layer (support) – 2″ of polyurethane transitional foam. 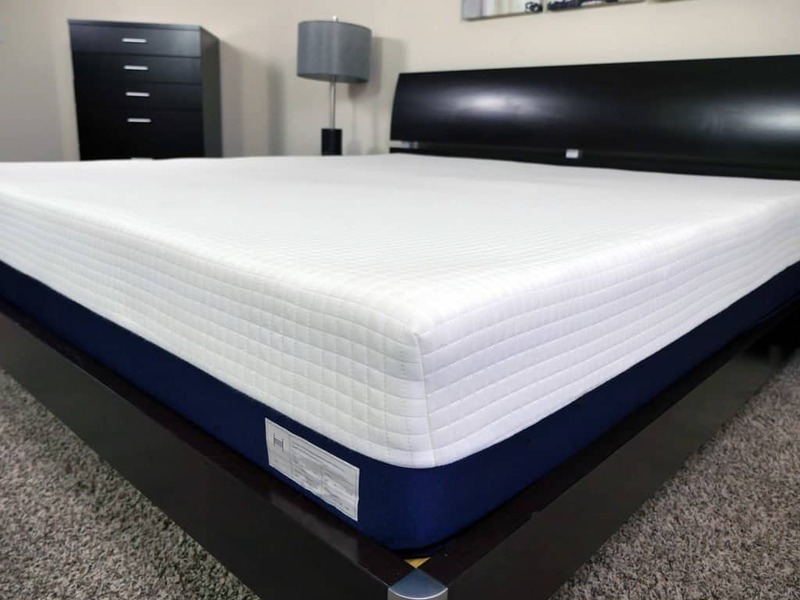 While this layer primarily acts as the transitional layer from the comfort foams to the base foam, it also provides a level of deep compression support for the sleeper. The ILD of this layer ranges from 20-26. This layer has a density of 1.8 PCF. Bottom layer (foundation) – 4.0″ of high density support foam. This layer acts as the main foundational base for the mattress as a whole. ILD ranges from 26-33. This layer has a density of 1.8 PCF. Constructed from 100% polyester, the cover of the Helix mattress contains a soft feel, durable build, and breathable fabric. The top half of the cover (white piece of fabric) is much softer than the lower half of the cover (blue portion). By design, this cover is much sturdier on the bottom, helping to prevent any damage while moving the mattress. From an aesthetic standpoint, the cover of the Helix is fairly basic, but well done. The checkered pattern on top helps to break up the white color scheme by adding a bit of flare to the cover’s design as a whole. All in all, I’m a fan of the way this cover looks. It’s not overly fancy, but still well done. Typically, I like to dive into the overall feel of the mattress, how it supports the sleeper, and the firmness level it provides. Yet, the Helix mattress is a little different. 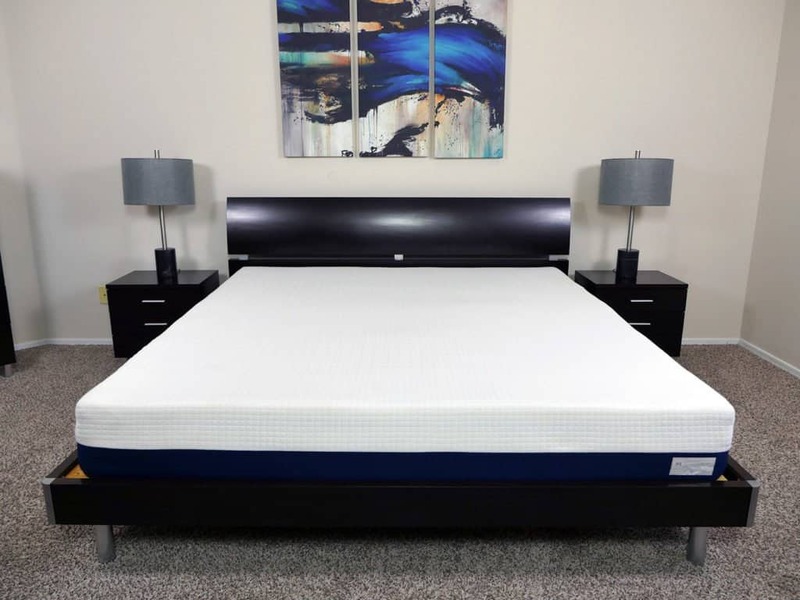 Before purchasing this mattress you are asked to complete a short sleep quiz, which then provides Helix with the information they need to create a customized mattress for you and your needs. 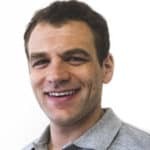 I will discuss the support and feel of my configuration, but keep in mind that each sleeper could have a different experience with this mattress, simply based on their sleep quiz and the resultant customized mattress configuration. With regards to the firmness of my Helix mattress, I felt as if the mattress landed at a 6 out of 10 on the firmness scale, where 10 is the most firm. During my quiz I selected the “medium” option when asked what firmness level I prefer. Helix mattresses are available from a very soft 3 out of 10 to a very firm 9 out of 10 (where 10 is the most firm), and every level in between. The feel of this mattress was quite nice. There’s a good level of contour, but not a dramatic level of sinkage. In addition, the top layer of responsive poly foam helps sleepers avoid that stuck or trapped feeling that memory foam often provides. The ability of this mattress to offer contouring without the stuck feeling is a major plus, in my opinion. Support was another impressive feature about the Helix mattress. Once again, this mattress was built with my specific body type and preferences in mind, so please keep that in mind. That said, my Helix mattress was able to support both my wife and I without any issues. As I slept on my stomach, I felt as if the mattress did a very good job of providing balanced levels of sinkage and push back. In other words, I was able to sink into the mattress enough to relieve pressure points, but the mattress did not continue to give in. Instead, I hit a point where the mattress felt as if it were pushing back up against me, but not in an uncomfortable way whatsoever. This combination came together to create a consistent angle along my spine, helping to avoid any sort of back aches. My wife explained that she felt virtually the same way while sleeping on her back. One brief experience from a Sleepopolis reader I would like to share. When I first tested the Helix, the design and materials didn’t give me much confidence that it would support heavier sleepers very well. However, one of my readers this past summer ended up purchasing the Helix anyway. He is a tall man and 350 pounds. His customized version of the Helix met all of his needs and ended up being a perfect fit for him. Needless to say, his experience was surprising, and it gives me more confidence in the Helix design. Bounce and cooling were two other positive characteristics about the Helix mattress. 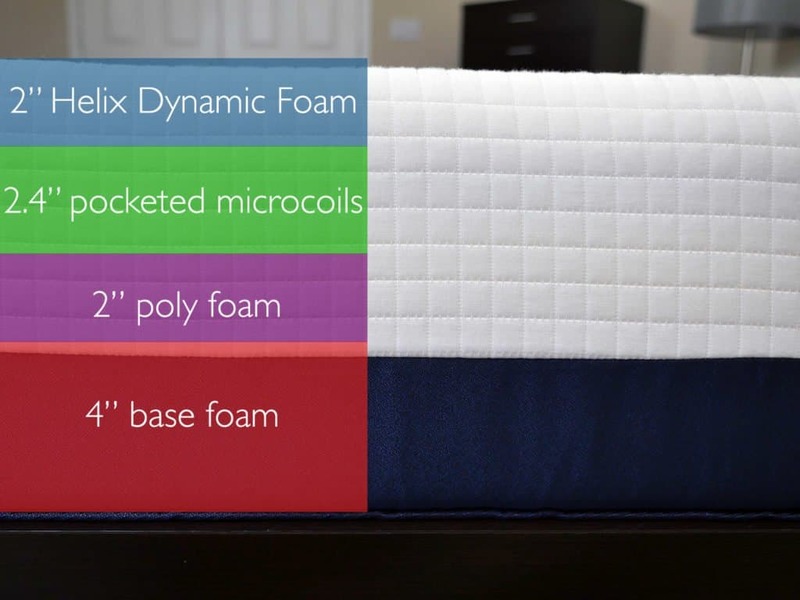 The Helix Dynamic Foam and microcoils used in my mattress created a level of bounce that made both amorous and daily activities much more enjoyable. Cooling was in the same boat. The materials used are highly breathable, helping to maintain a cooler sleeping surface all together. All in all, I have to say I’m a fan of the Helix mattress. Being able to customize a mattress for less than $1,000 is pretty amazing. Shipping – Free shipping to the US and Canada. Takes 1-2 days to make the mattress and 6-10 to arrive at your house. The Tuft & Needle mattress is an all foam mattress built from 2 separate layers, for a total height of 10″. Top layer ( comfort) – 3″ layer of poly foam. This is a proprietary foam called Tuft and Needle Adaptive Foam. The top layer of this mattress is designed to provide the comfort, cooling, and support for the sleeper. It has a density of 2.9 PCF. Tuft and Needle does not provide the exact specs of this foam, however, to me it looks and feels like Energex that has graphite infused into it. Bear in mind, this is purely speculative, as Tuft & Needle keeps the exact formula secret. Bottom layer (support & foundational) – 7″ of support foam. This layers acts as the base for the mattress in addition to providing support and deep compression support. It has a density of 1.8 PCF. The cover of the Tuft & Needle mattress is quite simple. An off-white color scheme with the Tuft & Needle logo embossed in several different places along the mattress. Ultra thin, by design, the cover of this mattress allows the foams to breathe easily, helping to improve the cooling for the mattress as a whole. That said, the ultra thin design does pose some questions in terms of durability. I’m afraid when I move the mattress the cover could easily encounter some damage. Given the thinness I would recommend being extremely careful when moving your Tuft and Needle. The Tuft & Needle brings home a medium to medium firm feel, landing at a 6-6.5 out of 10 on the firmness scale, where 10 is the most firm. By creating a mattress at this firmness level, Tuft & Needle had hopes of reaching a wider array of sleepers needs. 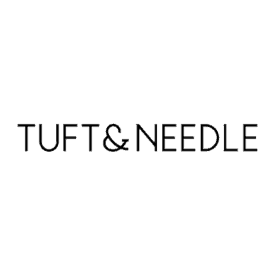 Although, Tuft & Needle is not opposed to changing the feel of their mattress. During the past 2 years I have tested 4 Tuft & Needle mattress, each of which hit a different number on the firmness scale. The most recent version of their mattress was closer to that 6-6.5 out of 10. As you first lie down on the Tuft & Needle, you notice a slight degree of sinkage followed by a moderate level of pressure relief and a strong push-back. A majority of sleepers will see about 1-2″ of sinkage on this mattress. That said, the sinkage is a bit different. Sinking into a Tuft and Needle Adaptive poly foam is not quite like a memory foam or latex. Instead of wrapping or sinking around you, it feels more like you are just compressing the foam below you. Personally, I find the biggest issue surrounding the Tuft & Needle mattress to be the thickness of their comfort foam. 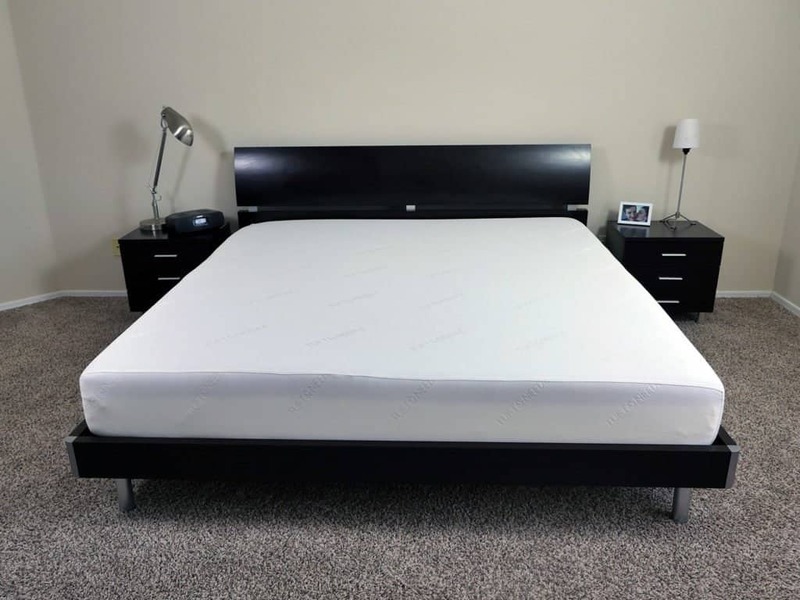 With only 3″ of comfort foam separating the sleeper from a very hard base foam, this mattress has a tendency to create comfort and support issues. As I lied on my side and back, I noticed the heavier portions of my body sinking in while the lighter areas were more or less resting on top of the mattress. This created unwanted pressure points along my major joints. FAQ: Best mattress for the money? As we move onto the cooling of the Tuft & Needle, I must say this mattress did a good job of maintaining a consistent temperature throughout my sleep test. 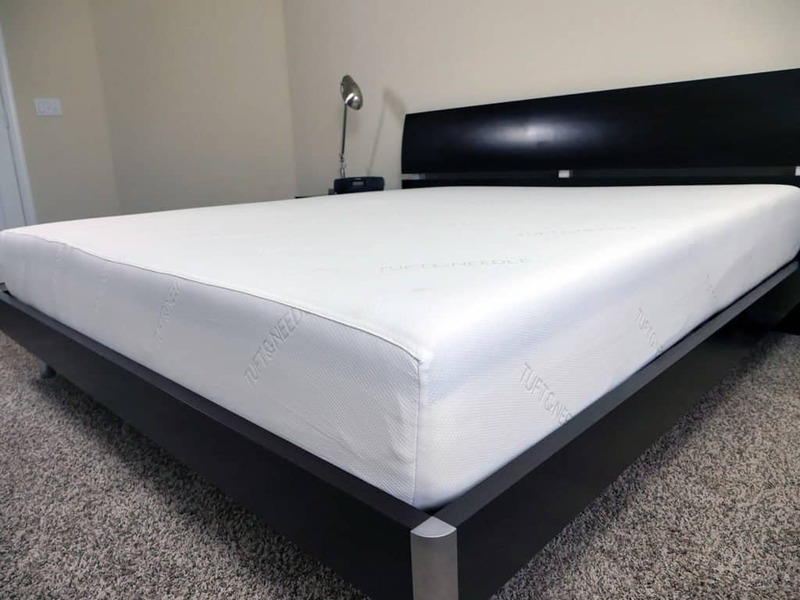 The combination of the thin cover and the top layer of graphite infused poly foam (graphite is speculation based on my opinion, T&N considers their foam components proprietary) come together quite nicely to improve the airflow in and out of the mattress. All things considered, the Tuft & Needle is a fine mattress. By no means is it a bad, but I do believe they could have made a few of improvements to the Tuft and Needle Adaptive Foam comfort layer. The use of a less viscous poly foam as the comfort foam, in addition to only sitting at 3″ thick, leads to less contour, support, and pressure relief than I would like. This may not be the case for every sleeper, but I do believe a majority of sleepers would want little more out of the comfort dynamic. Should I buy the Helix or Tuft & Needle mattress? While both the Helix and Tuft & Needle are fine mattresses, I must say that I believe the Helix mattress is the better overall choice. After spending several weeks on each mattress I found that the Helix was the more supportive, comfortable, and better valued mattress overall. Additionally, the ability of Helix to customize every mattress they make plays a large role in their victory over Tuft & Needle. The short sleep quiz provided by Helix allows sleepers to really provide the company with important information about their sleeping habits, which are then taken into account when the mattress is being created. Going hand-in-hand with this feature, the Helix uses 6.4″ (4.4″ if you exclude the transition foam) of comfort foam while Tuft & Needle only uses 3.0″. You like the idea of a customized mattress – the Helix mattress is 100% customizable. Sleepers have the ability to take a short sleep quiz and design a mattress that is made to fit their wants and needs. Not to mention, it is dramatically cheaper than most other custom mattresses. You want good bounce and cooling – the combination of poly foam, microcoils, and a thin cover make for a highly breathable mattress. 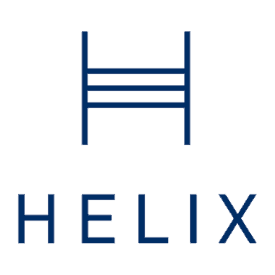 You’re unsure of what you need – if you’re not quite sure what firmness level or style mattress you need, Helix is a great option simply because the Helix quiz and customizable design takes much of the worry out of your decision. You sleep with a partner who prefers a different feel – Helix offers a split mattress design to allow partners to create a custom feel on their side of the mattress. The two custom sides are brought together within a single cover for a near seamless look and feel. You want a medium firm feel – the Tuft & Needle mattress comes in at a 6-6.5 out of 10 on the firmness scale (10 being the most firm). You want more of a floating feel – with a top thin layer of poly foam, this mattresses has a little more of a floating feel. You want to save some money – at $750 for a Queen, the Tuft & Needle ranks among some of the cheapest mattresses sold online today.